There were several things that stood out to me about the recent president Trump Afghanistan speech. Some good and some bad. The bad part of the speech was best expressed by former Intelligence and counter Intelligence insider, former diplomat, former presidential adviser and Psychiatrist doctor Steve Pieczenik who often appears on Alex Jones' show offering inside information and perspectives on current events. Recently Pieczenik clashed with Jones about Trump's speech on Afghanistan and as he has for so many years, Pieczenik told the truth about the situation in Afghanistan as it pertains to the story of 9/11. Or should I say, the government long disproved tall tale about 9/11, aka the 9/11 "official story". In his recent appearance on the Alex Jones show Pieczenik angrily called out Trump for not going with his initial instinct on Afghanistan (to immediately pull out) and instead allowing Secretary of Defense James Mattis and National Security Advisor H.R. McMaster to dictate the plan there. The reason for Pieczenik's visible indignation? That Trump is rationalizing his moves based on the lies of 9/11. Pieczenik reminds Jones that 9/11 was an "inside job" planned and orchestrated by elements within our own government and that al Qaeda (yes, al Qaeda!) was a creation of the West including its leader Osama Bin Laden himself who was once an asset to the CIA under the alias Tim Osmon. In their discussion Jones (although he doesn't spell it out directly as I will here) agrees with Pieczenik but he suggests that in fact Trump may essentially be applying a chapter from his book 'The Art of the Deal' and creating the environment for a pull-out of Afghanistan and a new era of working with Afghanistan financially not militarily. But is Jones right? And if so, what does this mean? More on this later. 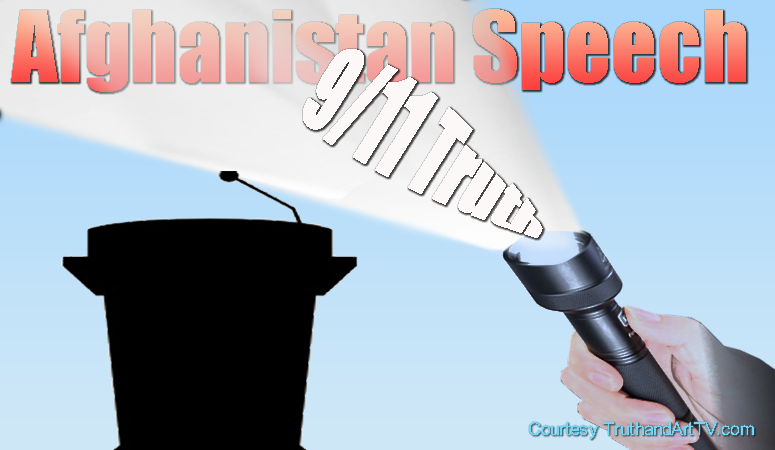 Meanwhile, as we approach the sixteenth anniversary of the September 11th 2001 false flag attack on our nation, Trump's recent Afghanistan speech is as a great a place to begin to expose how our government as a whole continues to repeat the lies of the Bush administration and the Obama administration that followed regarding this event. In every case we're told by now 3 administrations in a row that "al Qaeda terrorists" did the attacks even though not some but practically ALL the evidence available to humanity to this day points to a conclusion very different than this. From the highly suspicious over-the-top efforts the Bush administration put into stopping any investigation into the event, to the towering omissions and ignoring of evidence on the part of the 9/11 Commission, to the criminal in-your-face operation conducted by those in control of the crime scenes to destroy all the evidence as quickly as humanly possible, to the ocean of original 9/11 footage on the day of and the days surrounding the event that conflict with the official story, to the stunning details and information revealed about activities and statements within elements inside the Department of Defense and hire ups on the day of, to the shocking firsthand testimonies from witnesses including many police and firefighters who were there, to the scientifically-silencing results of the work of many professional scientists, architects and engineers proving the planned controlled demolition of 3 WTC towers, and on and on. The reality is that sixteen years later the evidence behind 9/11 being an inside job is a mountain which cannot be moved. It is a pillar that stands on its own. It (9/11 Truth) was built by humanity with many years of hard work, sweat and tears. Many have given their lives in order for the truth of 9/11 to live on (John O'Neil, Barry Jennings and Danny Jowenko to name just a few). And so with Trump echoing the lies of 9/11 in the early part of his speech in order to justify the original invasion of Afghanistan in 2001 we need to step back and analyze every possible scenario and consider where these scenarios may be leading to. But before we do that, let me remind readers that it is our duty to continue to uphold the truth about 9/11 and never accept lies to go unchallenged regardless of who is echoing them. "This was an unbelievably powerful building. If you know anything about structure. It was one of the first buildings that was built from the outside. The steel, the reason the World Trade Center had such narrow windows is that in between all the windows you had the steel on the outside. You had the steel on the outside of the building. That's why when I first looked at it, when I first looked, you had big heavy I-beams. When I first looked at it I couldn't believe because there was a hole in the steel. And this was steel that was ... you remember the width of the windows of the World Trade Center, folks. I think that, you know, if you were ever up there, they were quite narrow and in between was this heavy steel. I said, how could a plane, even a 767 or 747 or whatever it might have been. How could it possibly go through the steel? I happen to think that they had not only a plane, but they had bombs that exploded almost simultaneously. Because I can't imagine anything being able to go through that wall. Most buildings are built with the steel is on the inside around the elevator shafts. This one was built from the outside which is the strongest structure you can have and it was almost just like a can of soup. " "It just seemed to me that to do that kind of destruction, is even more than a big plane, because you are talking about taking out steel, the heaviest caliber steel that was used on the building. These buildings were rock solid. And it's just and amazing, amazing thing. This country is different today. And it's going to be different than it ever was for many years to come. So if it's any consolation to Trump supporters and those who wish to see justice for 9/11 remember that Trump knows what happened as can be seen by the statements he made in the past. A closer look therefore at the recent Jones-Pieczenik discussion about Afghanistan leaves no doubt that Pieczenik is entirely right about what he's saying. Trump needs to militarily pull out of Afghanistan, call out the lies of 9/11, stop listening to Mattis and McMaster and move on to better things. But here's something very interesting I picked up on. A closer inspection of the Afghanistan speech starting at around the 19:30 reveals another side to the Trump speech that suggests that perhaps he IS looking forward to "better things" after all in Afghanistan that do not involve military presence. And just maybe Alex Jones may not be wrong in his speculations either. What am I talking about? "we want them to succeed, but we will no longer use American military might to construct democracies in far away lands or try to rebuild other countries in our own image. Those days are now over"
"Instead we will work with allies and partners to protect our shared interest. We are not asking others to change their way of life, but to pursue common goals that allow our children to live better and safer lives. This principled realism will guide our decisions moving forward. Military power alone will not bring peace to Afghanistan or stop the terrorist threat arising in that country ...Our support is not unlimited ... The government of Afghanistan must carry their share of the military, political and economic burden. The American people expect to see real reform, real progress and real results. Our patience is not unlimited. We will keep our eyes wide open in abiding by the oath I took on January 20th I will remain steadfast in protecting American lives and American interests. In this effort we will make common cause with any nation that chooses to stand and fight alongside us against this global threat"
Interestingly, this possibility of the US slowly moving away from the model of military occupation in foreign countries would theoretically at least line up with several stories reported by antiwar.com and other outlets in the past few months. One report talked about the end of the "regime change" agenda in Syria and the other discussed where it was being reported in early August that the White House and Rex Tillerson are officially removing from the stated mission of the United States any mention of the goal of "spreading democracy" around the world. This commitment and mission statement of course has been the reason given for the invasions of many nation states for over 100 years now. At the very least this is interesting and it would theoretically be consistent with a Trump speech about being more interested in doing business in Afghanistan and letting them handle their own problems. So in summary there are several possibilities here. One is that Trump is blindly listening to his generals and believing whatever they say. I chalk this up to being naive. The other is that Trump is knowingly going along with a plan to stay in Afghanistan forever and he's just lying about this new approach. I chalk this up to deception or perhaps fear of being taken out. Another possibility is that Jones could potentially be right and Trump is strategizing the situation in a manner that seems to please the deep state (going along with 9/11 lies for now and saying he will send in more troops to Afghanistan) but in a way that slowly but surely reverses course (as we have seen in the reversal of the anti-Assad Syria situation) and or outlines financial goals and partnerships with those countries. That reminds me of the recent statements made by Trump regarding North Korea where he talked about how lately he has noticed North Korea's good behavior and how he "respects" that. He even suggested that the US relationship with North Korea could potentially change very quickly depending on circumstances. One could argue that this appears to be a typical Trump move, dangling money in someone's face as if to say "let's make a deal instead of fight". Is it then possible that we are witnessing Trump the deal maker in action? Could it be that Jones is right and that Trump is playing the deep state by quietly masterminding his own business deals to make peace, not war, with nations the US was previously at war with before he took office? Is Trump finding ways to still talk tough to please the Military Industrial Complex (think business $) while quietly orchestrating deals with supposed enemy countries attempting to turn them into financial partners? Trump appears to have a knack for answering to violence and tough situations with money, deals and jobs. Recall that the final question Trump answered in one of the Charlottesville Virginia attack press conferences was a question about how he was planning to bring healing to this situation. Trump's answer? Bring more jobs to America! That said, ultimately, even if we are watching another "deal" by Trump at a global scale the facts regarding 9/11 remain the same and all Trump supporters and 9/11 Truth seekers must hold Trump to his words from 2001. We know that Trump knows the truth about 9/11 because he's on record admitting that he believes special planes i.e. drones and uniquely powerful explosives were used to bring down the towers. So when it's all done I say that Steve Pieczenik is morally correct and the point he is making is more important in order for all of America and humanity to heal from the 9/11 lie. Pieczenik is shining the bright light of 9/11 Truth which he knows is forever and kudos to him for standing strong in his convictions. The questions we need to ask then are: Will 9/11 Truth come out during the Trump era as Trump promised before being elected? Is there enough support inside the administration to realistically make this happen without Trump being assassinated? Will the Trump base hold Trump accountable for not investigating 9/11 Truth? Here are some other possibilities. Will Trump wait until his second term to crack open 9/11 Truth in order to protect himself from a re-election backlash or will the price of not pursuing 9/11 justice now do him in? Which is the best strategy and is he considering any of these? Is there more going on behind the scenes that we don't know? I have a feeling that we will surely find out over the next few years. There has been a lot of underground talk that the elites in the deep state are indeed worried about Trump reopening 9/11. For now it appears those that did 9/11 can breath easy with Trump brushing 9/11 Truth under the carpet in his first 8 months in office. If there is anything we know about Trump however, it is that he is very unpredictable. This is even more reason for his supporters to be very tough on him and keep his feet over the fire while remaining optimistic that something will happen. In case you haven't noticed Trump seems to respond when put under the fire. And for this reason today I'm calling out the Afghanistan speech as laced with vicious lies about 9/11 which we need to purge our collective consciousness from once and for all. I get it that timing is everything so I hope that Trump understands where we're coming from when it comes to 9/11. A topic which will ultimately, I believe, be the truly defining issue which could catapult Trump to the status of being the greatest president in American history versus just another really good deal maker. Which one will it be?